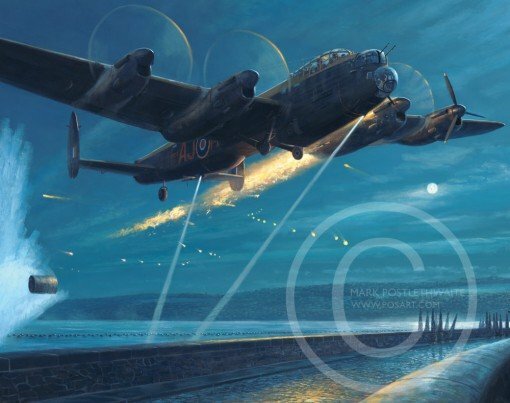 Flt Lt John Hopgood DFC* hauls his crippled Lancaster over the Möhne Dam after making the second bombing-run of Operation Chastise, 17th May 1943. The Lancaster, ED925 ‘M’ for Mother, had been badly hit by flak on the way to the dam, but despite being injured along with other members of his crew, Hopgood decided to press on to the target. Unfortunately, having been alerted by Guy Gibson’s first attack, the defences were ready and knew where the second attack was coming from. ‘M’ for Mother flew into a sustained barrage of 20mm cannon shells and was repeatedly hit in the port wing and fuselage, catching fire just as the Upkeep was dropped. With the aircraft rapidly becoming uncontrollable, Hopgood managed to gain enough height to allow three of his crew to bale out, (two successfully), before the Lancaster exploded and crashed in pieces, taking the remaining crew members to their deaths. John Vere Hopgood was just 21 years old.